Why can't I find my destination on Google Maps? Why don't destinations provide proper addresses? Why can't I see my destination on Google Street View even though the address is correct? 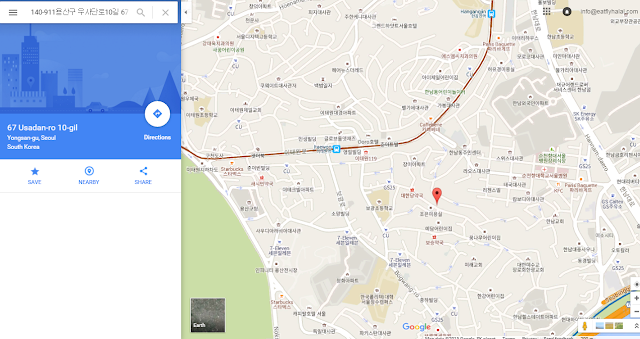 The answer: Google Maps is not commonly used in Korea, so everything you find might possibly be outdated. 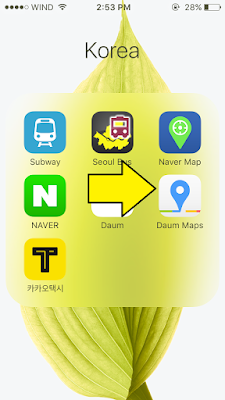 Instead, Koreans use two Map services similar to Google Maps, called Daum and Naver. 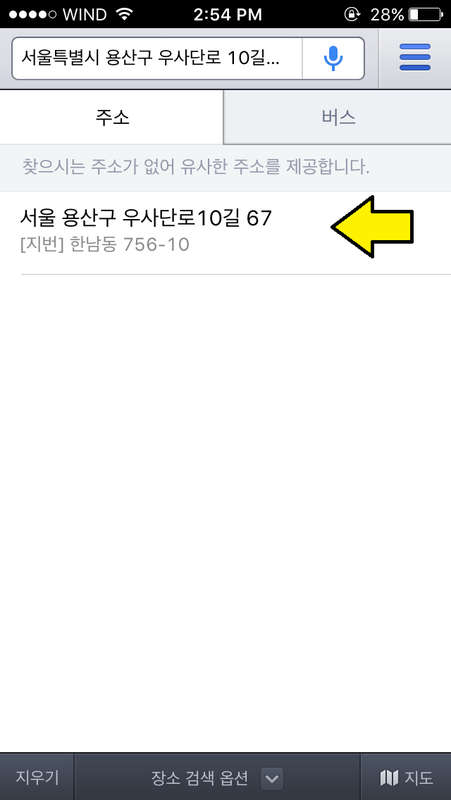 I'll be focusing on Daum as I found it much easier. BEFORE YOU BEGIN: Based on advice from other Korean Bloggers, if you don't speak Korean it is imperative for a traveller to carry the address of your destinations in the Korean Language if you plan to use a taxi or ask for directions, as the transliterated addresses will not be useful, as some taxi drivers will not speak English. I suggest using Google Drive to create an Excel Spreadsheet with the addresses so you can access them on the go. Throughout this guide I will be suggesting to save certain things to your Google Drive Spreadsheet. As well, also download Google Drive to your phone as you will need the app later. 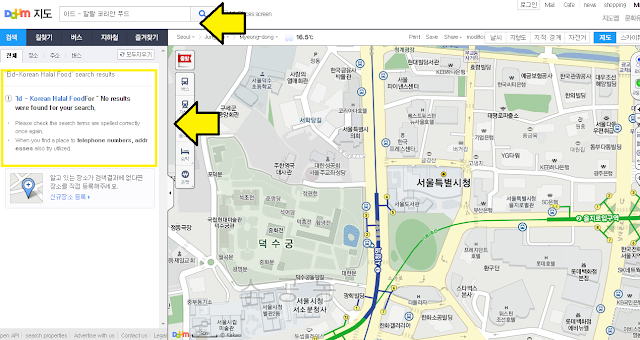 Here is a Step-by-Step Instruction Guide on how to properly find your destination on Google & Daum Maps, and confirm that it is really there using Daum's Streetview option. Step 1. Choose your location: I will be trying to find "EID - Halal Korean Food" Restaurant which I found on Trip Advisor. I personally feel more comfortable choosing destinations that have recently been reviewed on Trip Advisor to ensure that the destination is still in operation and that other people have been able to find it. 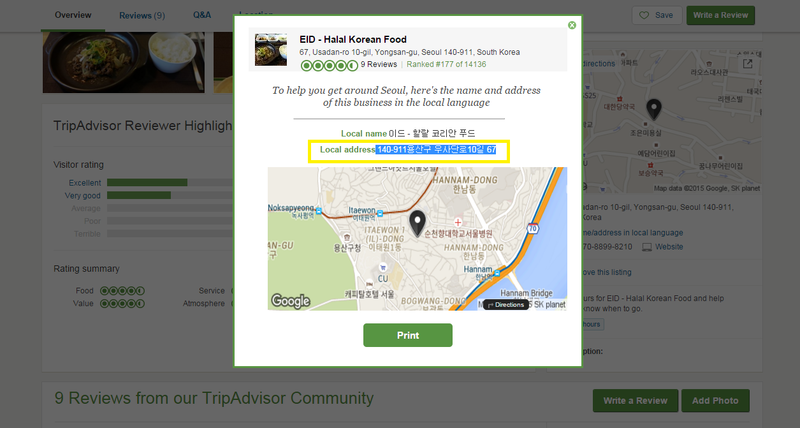 Step 2: On the right side of the Trip Advisor page, there is a link that says "Name/address in local Language". 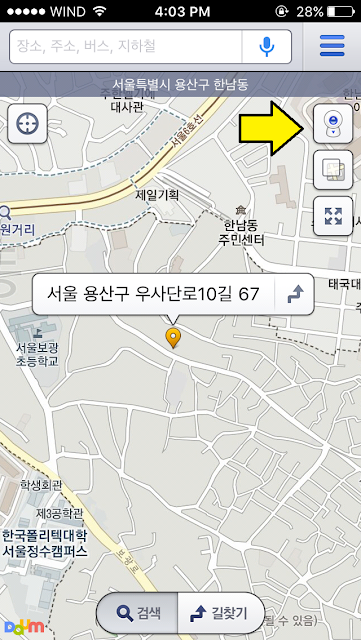 Click that and copy the Local Address in Korean. Note: The English transliterated language will not usually work. 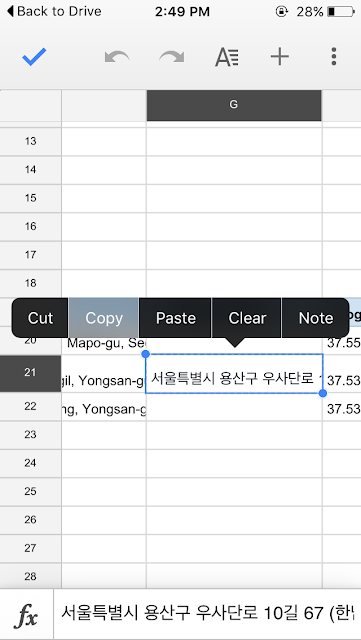 Save this address in Korean in your Google Drive Spreadsheet, as well as the provided English transliterated address for your reference. 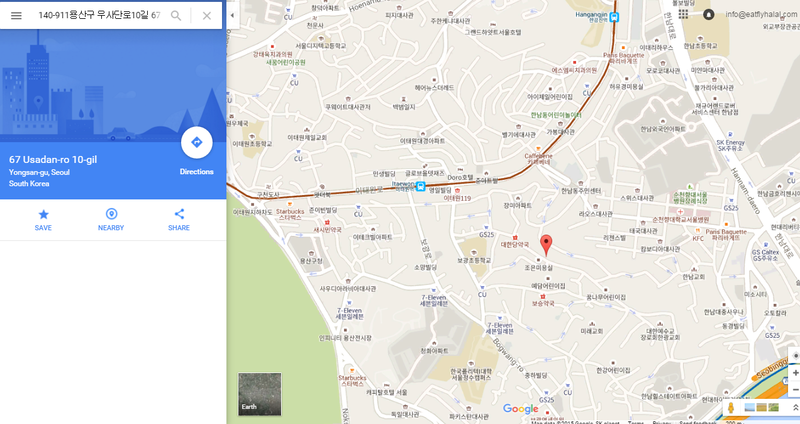 Step 3: Paste and search the Korean address in Google maps, and compare the pinned location to the map provided on TripAdvisor on the top right area of the page. Sometimes the address that you are given is actually a district and not a specific address, so you should ensure that what you've just searched is actually the right location. If it isn't, compare the two maps until you can pinpoint the right place on Google Maps. Once you've found it, I would suggest saving it by clicking the red Pin and clicking "Save" with the star icon on the left. Compare to TripAdvisor Map. Yup, they're the same! Step 4: Drag the Little Streetview Guy on Google Maps to your pinned location and search around to see if you can find the restaurant. I couldn't. If you take a look at the top left, you'll see the photo was taken in 2009, whereas this restaurant opened in 2014. It's possible that one of these buildings is actually it, but instead we'll have to find it on Daum. I couldn't find Eid Restaurant, but since this was taken in 2009, I think it should be one of these buildings. Step 5: Using a Chrome browser (this is important), go to map.daum.net. 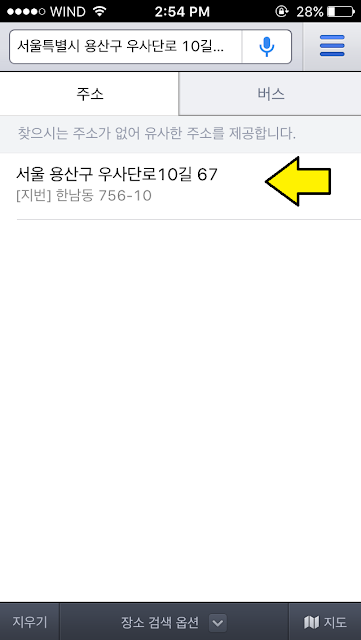 The Korean text on the page should automatically translate to English, however if it doesn't, right click the page and select "Translate to English." Paste the Korean Address in the search bar and hit enter. 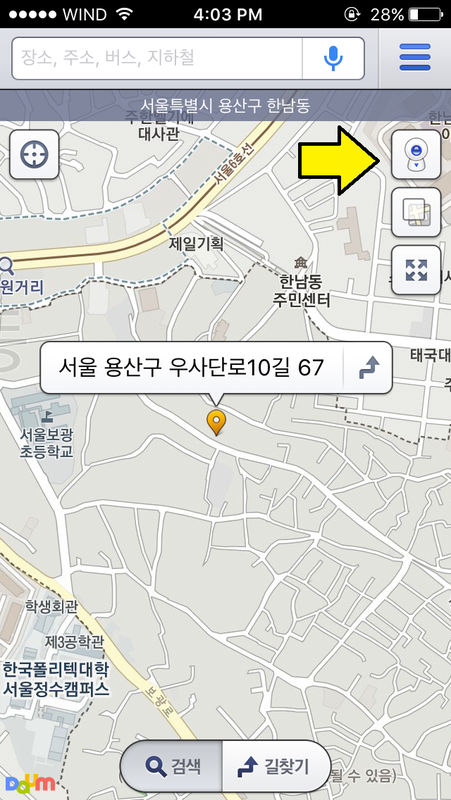 As you can see, once the Korean text translates into English, you can see that the address you've just searched wasn't found. Okay, let's try the name of the Restaurant in Korean instead. Copy the Restaurant name in Korean from Trip Advisor and search that. As you can see below, this didn't bring up any results either. Step 6: If Step 5 didn't work for you, you've got to find the proper address that works. Search around for the official website of the destination. 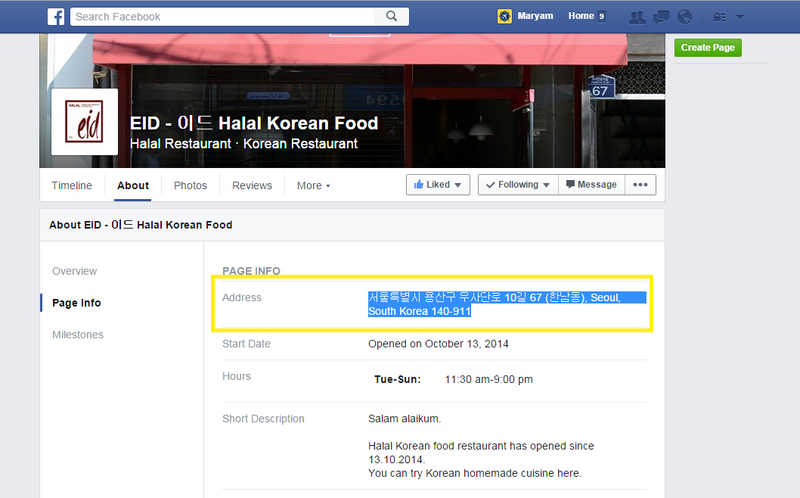 I found this restaurant on Facebook, and in their Page Info section, I found the address. 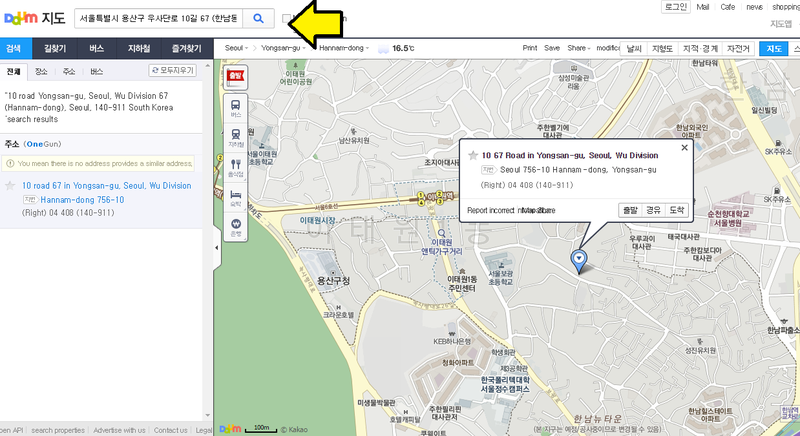 Step 7: Search this address in Daum again and see if the right location pops up. I compared this map to the location I have in Google Maps and found that this is the right address! 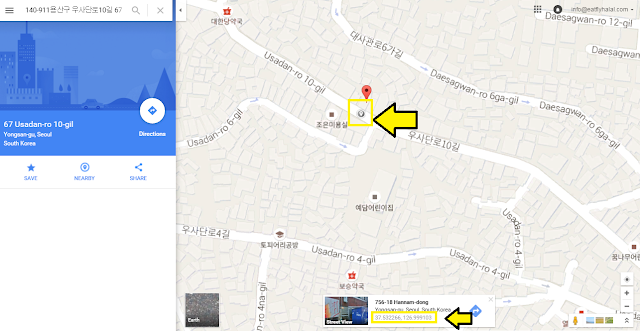 Make sure and save this address in Korean in your Google Drive Spreadsheet, as you will need this if you need directions in Korea. Step 7a: But what if this address didn't work either? No sweat, we'll use GPS coordinates instead. 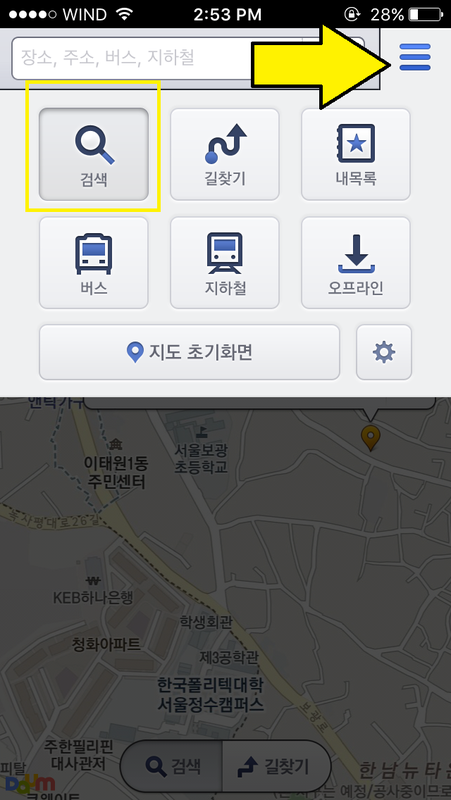 Go back to your Google Map and click an empty area close to where your pin is (but don't click on the pin). A small box will pop up below with the GPS coordinates of that spot. Copy them. Step 7b: Search for these coordinates in Daum, it should arrive on the same spot. Step 8. Now we're going to check the streetview to see an updated photo of this street. Near the right, there's a small camera icon. Click that. The streets all around your pin will become blue, and your mouse will have become a little Camera Pin. Click the street where your Pin is located. Step 9. Search around a little bit and voila! 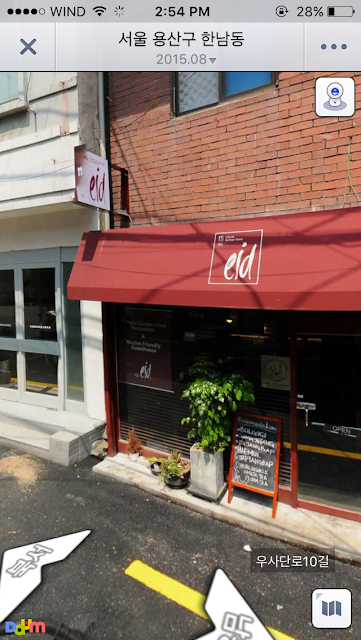 It turns out the building with the red bricks from the 2009 Google Street View became Eid Restaurant! Hooray! Alright, so you've confirmed the correct address in Korean and you've saved the address and the GPS coordinates to your Google Drive Spreadsheet to ensure that this is the right location. 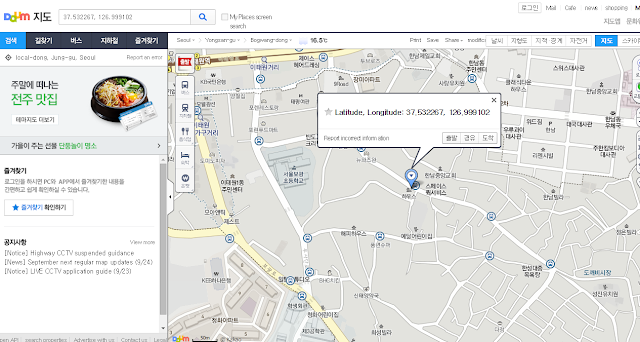 Now what do you do when you're in Korea and you need directions? 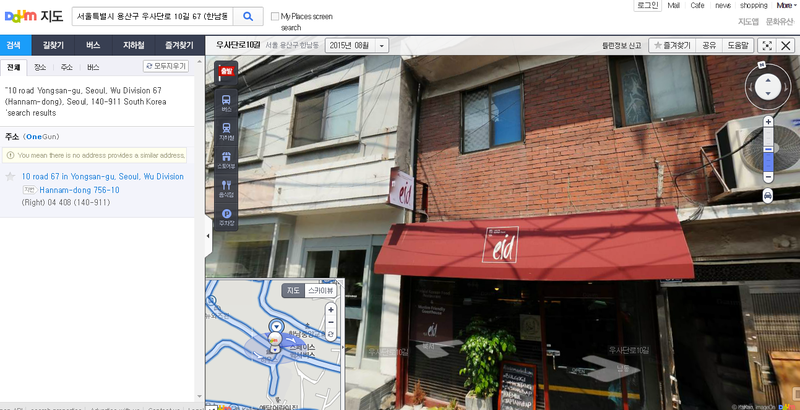 Or perhaps you would like to see the streetview of the location on your phone while you're walking there? 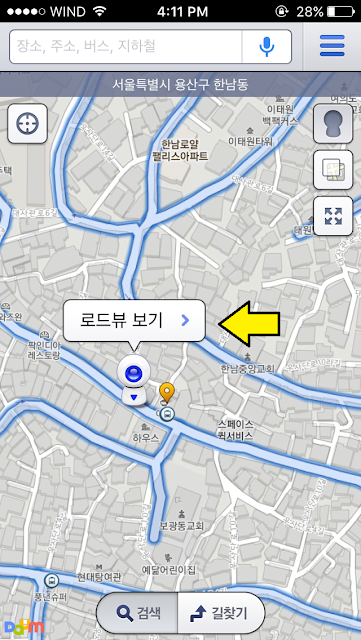 Granted, now that you've saved the location on Google Maps you should be able to find it, but just in case, let's use the Daum App on your phone to find the map and be able to access the streetview on your phone. 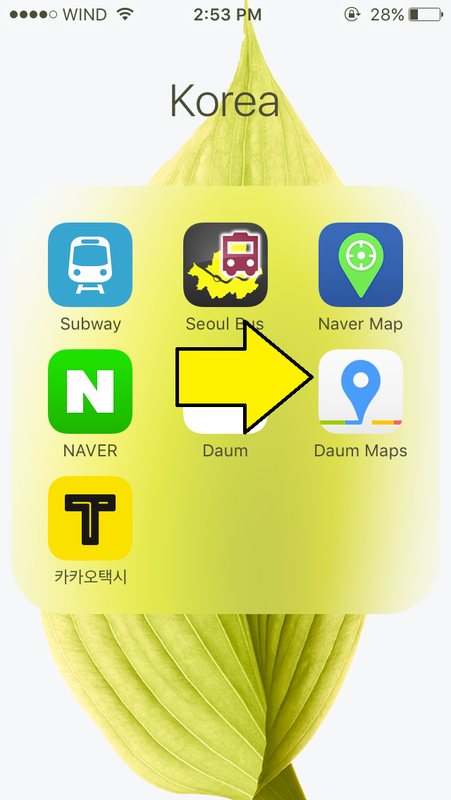 Step 10: Download Daum Maps from the Google Play store or Apple Store. It's free! Step 11: You'll be hit with a completely Korean interface with no English options, but through trial and error I discovered that you hit the top right Menu button, and then hit the magnifying glass button. Step 12: Open your Google Drive Spreadsheet, and copy the correct Korean address that you saved before. Step 13: Paste the address into the search bar and hit search. I'm assuming what will come up is a corrected address, so try selecting it. Step 16: The map pin should be automatically placed where the pin was previously, but just in case, hold and drag across the screen and release to place the camera pin where you want it. Then, click the text above to get into streetview. Step 17: Search around a little and.. voila! You've found it! 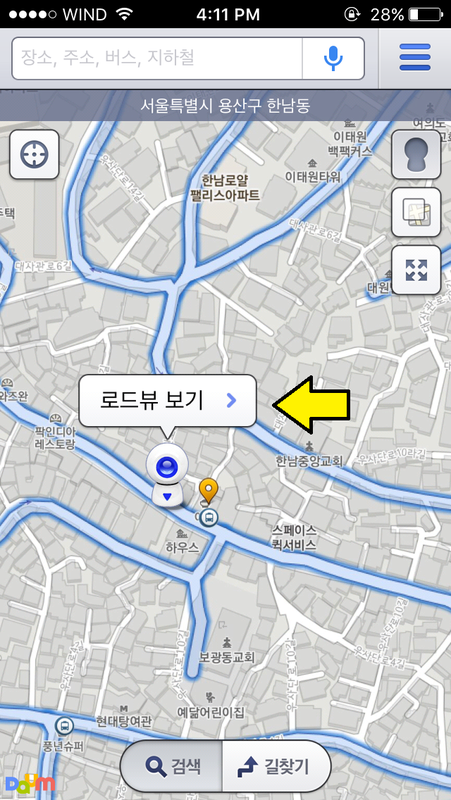 Having streetview on hand will be handy if you're lost or if you're trying to see that you're going in the right direction, as you'll be navigating the streets of Korea mainly on foot. I hope this guide has been helpful to you! I will be using this exact method to put together my itinerary for our trip. When we return inshaAllah, I will update this guide with any tips or corrections based on our experience. If you have any questions, please comment below!